There are two varieties of savings bonds small investors should know about: Series EE (also now known as The Patriot Bond) and Series I Savings Bonds. Teenvestors, however, should be only concerned with Series EE Bonds. 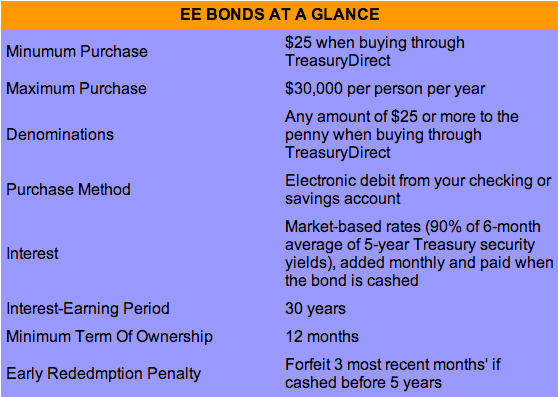 A sample of the Series EE Bond is shown below. The Series EE Savings Bonds is a type of bond called a zero coupon bond in which all the interest you earn on the bond is held for you until you cash-in the bond. The Series EE Savings Bond earns interest based on the 5-Year Treasury Securities rate – a rate published by the government that can be found in financial papers such asThe Wall Street Journal or Investor’s Business Daily. At the time of this writing, the Series EE Savings Bond had an interest rate of 2.66% compounded every 6 months. Series EE Savings Bonds come in eight denominations (also know as face value) – $50, $75, $100, $200, $500, $1,000, $5,000 and $10,000. With this many options, you can tailor your savings to meet your goals and needs. The amount you’d actually pay for the Series EE Savings Bonds is half the face value (i.e. half the denomination). For example, you can buy a $50 Series EE Bond for $25 and the interest you earn will be held for you until it at least doubles your initial investment. The Treasury Department never charges fees when you buy or redeem savings bonds. After you buy a savings bond, you are required to wait at least six months before you can get your money back. Once 6 months have elapsed, you can get your money back plus some interest, although not the full interest you are due. If you want to cash in your savings bonds before five years have elapsed since you bought the bonds, you will loose three months worth of interest. After five years, you will get the promised interest and you can get your principal back if you’d like. The points below apply to all denominations of Series EE Bonds – we just use the $50 Bond as an example. If you buy a Series EE Bond with face value of $50 for $25, you will have to wait for at least 17 years to get $50 back from the government. The reason you’d get back $50 is that over those 17 years, your interest will pile up with the government so that your $25 grows to $50. You don’t have to cash in you bonds at the end of 17 years if you don’t want to. You can wait an additional 13 years – making it 30 years in total – at which time you can earn additional interest. The interest you earn from savings bonds are exempt form all state and local income taxes. You will, however, owe Federal income taxes on the interest when you cash them. The earnings may be exempt from Federal taxes if you use the bonds to pay for college tuition and fees. Savings bonds are very safe because they are guaranteed by the U.S. government. Your principal and earned interests are safe and can’t be lost b-cause of changes in the stock market or other financial markets. Savings bonds are registered with the Treasury Department, so if you loose them or they are stolen or destroyed, they can be replaced at no cost to you. You can buy savings bonds at over 40,000 financial institutions nationwide. Chances are that your local bank sells them. You can also buy them online with a credit card at Treasury Direct (accessed through www.savingsbonds.gov), which is also an excellent website for Savings Bond information. We are told that eventually, you will only be able to buy Savings Bonds from Treasury Direct. When you purchase a savings bond, you receive a certificate with your name (or the name of the person for whom you have purchased the bond) on the face of the bond. The person named on a savings bond is the person to whom the bond is registered. Registration establishes who is the owner of the bond. Only the person who is registered on the bond can cash the bond. As far as the government is concerned if you are not registered you are not the rightful owner of the bond. Registration is also helpful in replacing lost, stolen or destroyed savings bonds, and in finding the owners of savings bonds that have stopped earning interest (i.e. 30 years have elapsed). In order to register Savings Bonds, you need to name the person for whom you are registering it (this could be you or someone else) and that person’s social security number. Beginning investors who have very little money to invest may want to start with the Series EE Savings Bonds since that requires an investment of half the face value amount. For example, if you want to buy a Series EE Savings Bonds with a face value of $200, you only need to invest $100. The first step is to open a Treasury Direct Account. A Treasury Direct Account requires: a social security number (a parent's number); a driver's license; a checking or savings account from which you'll need the account and routing numbers; and an email address. The next step is to select the owner of the security (which I presume is you since your parents are buying on your behalf and will enter your social security number), select the type of Saving Bonds to purchase (in denominations of $50, $100, $200, etc. ), and schedule other optional future purchases using the bank account on record. The final step in the application is to review all the information you put in and all your purchase requests. After submitting your order, you will get a message that tells you that money will be pulled out of your account for the purchase of the Savings Bond within one business day. You are also told that a record of your Savings Bond is placed into your account -- You will get no paper U.S. Savings Bond.